So welcome to my new blog here, my 1st ever blog! as the MyWuXing journey gets underway. So what do I intend to use this blog for? The Game – where the Game is now, where the game is going, how to further evolve the Game, reading & commenting on your ideas from the forum. Changes in the game rules to evolve into an even better game. The Art – the Art themes, the idea & intended direction of MyWuXing Art. 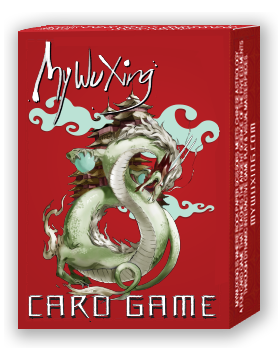 I am certainly looking to introduce new artists over time & hope my followers can purchase the MyWuXing Art sets so I can encourage Dia, the brilliant Artist behind the launch illustrations to work on another set with a different spin. She is in big demand right now – no surprise there! The Five Elements – observations & comments on the Five Elements around us. Here in Los Angeles right now we are coming out of Spring & heading into Summer – the Wood Element leading into the Fire Element. I also have a day job to contend with so please be patient – patience is actually a characteristic of the Wood Element in fact, like a Tree – they have to be patient right? J. I see this journey as a marathon rather than a sprint so will be pacing myself J.